Natural alum. finish, clear anodized. Full set to replace all the stock length pushrods on your Trax..
MIP Spline CVD Kit,Traxxas E-Revo. ..
MIP's new shiny CVD's for the REVO. These things are huge compared to the T-Maxx CVD's. These are ca..
MIP CVD Lightweight Bones Aluminum (2) Traxxas Revo ..
Pivont Ball Caps & Dust Boots Revo style drives. T-Maxx 3.3/Revo Etc. ..
A complete set of 4 super heavy duty REVO Turnbuckles, with left & right hand threads for easy, ..
A complete set of 4 super heavy duty REVO pushrods, with left & right hand threads for easy, on ..
Super Shock Savers Revo purple (4) ..
K-Factory REVO Spinner Kit. Color: Silver. Bolts to stock REVO wheels. 1 Pair. You'll ne.. Protect the fuel tank from damage on your REVO. Machined alum. 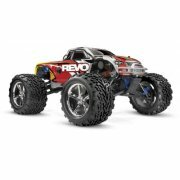 plate keeps out most items that can r..
REVO 2.5 Aluminum Flywheel, BLUE Fits Traxxas REVO 2.5, possibly other REVO/Summit Trucks. ..
Revo Pipe Coupler, Exhaust Deflector W/ Cable Ties ..